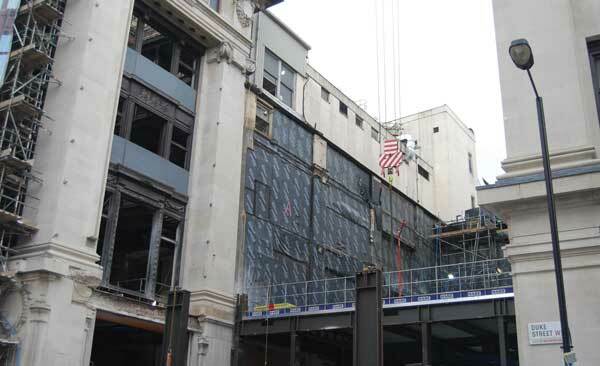 Phase Two of Selfridges multi-million pound revamp of its Oxford Street department store has begun with the transformation of the Duke Street elevation. Having created new loading bays and egress ramps as part of Phase One, the latest phase consists of creating a new east entrance and a larger Accessories Hall by in-filling the area where the old bays were previously located. A complex engineering procedure is required to install a new free-standing steel structure within a tight footprint, which is surrounded by retail areas that will remain open throughout the construction works. Working on behalf main contractor Blue Sky Building & Sir Robert McAlpine JV, William Hare is the steelwork contractor for the project. Phase One of the Selfridges redevelopment has been shortlisted for this year’s SSDA, while Phase Two will be covered more extensively in New Steel Construction Nov/Dec issue.